Oftentimes, it’s useful to know what kind of content your users are creating. Be it posts, comments or custom post types, filtering users by their content can help you better understand your audience. Therefore, our goal for today is discovering the different methods for filtering the WordPress users by the content created. The type of content that users can create in WordPress can be very different. What kind of content your WordPress users create depends on your website’s type and purpose. For a blog website, the content can be simple blog comments from your readers or articles written by your authors. For online stores, the content is usually in the form of product reviews and products added by the store owners. If you are running a BuddyPress social network, your WordPress user content can be all kind of activities, messages, groups etc. Not all of your users are going to participate equally in the content creation on your website. There is a version of the Power Law that is called the 1% rule. It is a rule of thumb describing the participation of Internet users in the content creation. Basically, what it says is that only 1% of the users of an interactive website will create new content and the rest 99% will observe, but not participate. Only 1% of the users of an interactive website will create new content and the rest 99% will observe, but not participate. Following the Power Law of distribution and the 1% rule, very small number of users are going to be responsible for the creation of the most of the content on your website. Identifying your most active content creators and knowing what type of content they have created, is a valuable information that can help you better manage your users and optimize your website. Undoubtedly, it’s important to know which users are responsible for content creation and interaction. Therefore, we’ll see how you can use the Users Insights plugin to gather this information. In general, there are two ways to find what content a particular user has created with Users Insights. One way is to simply sort your WordPress user table by using any of the content related fields like number of posts and comments. This will get you a list of your users, ordered by the number of content items that they have created from each different type. You can also access a detailed list of all the content that each WordPress user has created by opening the user’s profile page. The user profile page shows an extended list of all the content that a user has created, organized in groups by the different types of content. 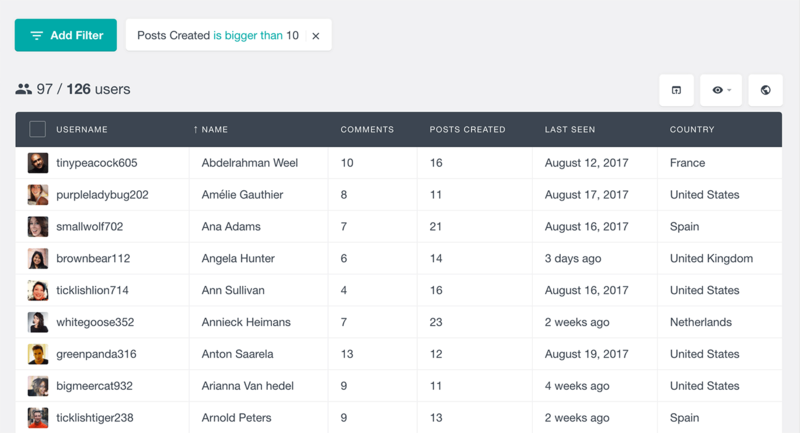 When it comes to the default WordPress user generated content, Users Insights provides the Comments and Posts Created columns. As its name implies, the Comments column shows the number of comments that each user has submitted. The Posts Created column on the other hand, shows the number of posts that each user has created. This includes regular blog posts, pages and custom post types. If you need to see the different custom post types separately, please refer to the “Ordering and filtering users by custom post types created” section below. To view how many posts and comments your users have created, just make sure that these columns are visible from the Eye-icon menu. Oftentimes you might want to see who your most or least active content creators are. This can be easily accomplished just by sorting the user table by any of the content columns. For example, in order to find the users with the most comments on your WordPress site, all you need to do is sort your user table by the number of comments. You can do this by clicking on the Comments column heading in the user table. Once you have the list of the users with the most comments, you can click on any user to open their profile page, where you can see a full list of all the comments that this user has created. In a similar way, you can also sort the user table by the number of posts created, just by clicking on the “Posts Created” column heading. 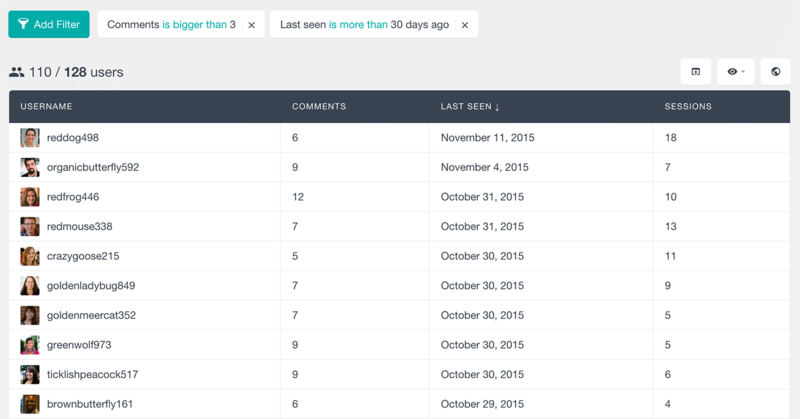 Another way to find your active content creators is by using the Users Insights smart filters. By using multiple filters, you can further segment your user data and get a more detailed users list. Here are some examples that illustrate how you can use the filters to analyze your users by the content that they have created. 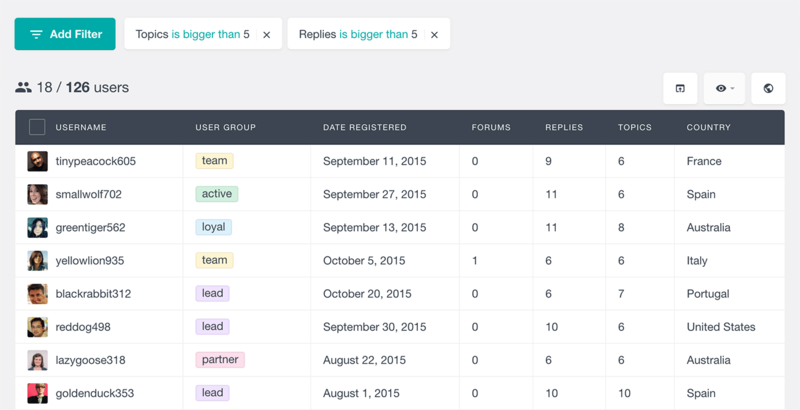 The Users Insights stackable filters allow you to do a more advanced user filtering. For example, let’s just say you want to find the users who used to be more active commentators, but haven’t shown any activity recently – this could be the WordPress users that have al least 3 comments but haven’t showed up in the last month. In order to load this list, just add a filter that shows all of the users that have more than 3 comments. Then you can add a filter by “Last Seen Date” to further segment these users, so that only the ones that haven’t been online in the last month are displayed. Similarly to the comments filter, you can easily filter your WordPress users by the number of posts that they have created. 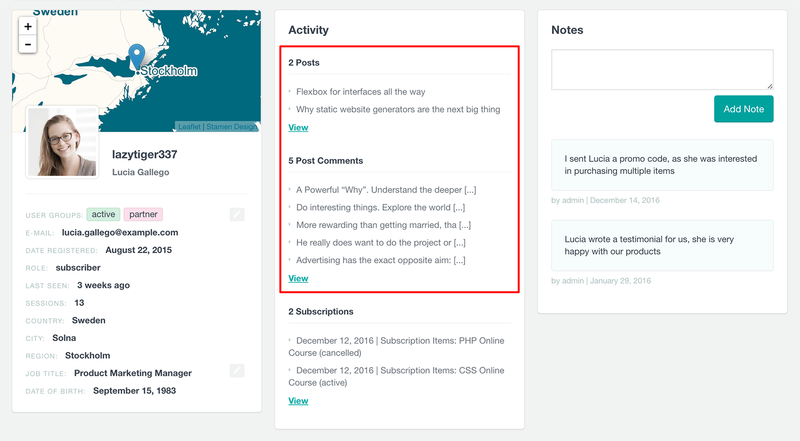 For example, if you want to find the list of your most active post creators, you could just use a filter like “Posts created is bigger than 10”. You can easily export these users in a CSV file and get in touch with them using MailChimp and send them special offers, beta testing programs, partnership deals and so on. Furthermore it’s possible to add them all to special groups, such as active author or top commenter. Many plugins often use custom post types to store their custom content. For example, a book directory plugin could be storing each book as a custom post type. Or a public forums plugin could be storing the user topics and replies as a custom post type. If your site allows your users to create different custom post types, you might also need to list and filter the user generated content separately based on the different post types. You can easily accomplish this by using the free extension Custom Post Type Filters For Users Insights. Finally, it’s time to check not just the numbers, but the actual user activity. For this case we’ll look into the user profiles. In the user profile you can see all the user generated content, such as posts, comments and other custom post types. 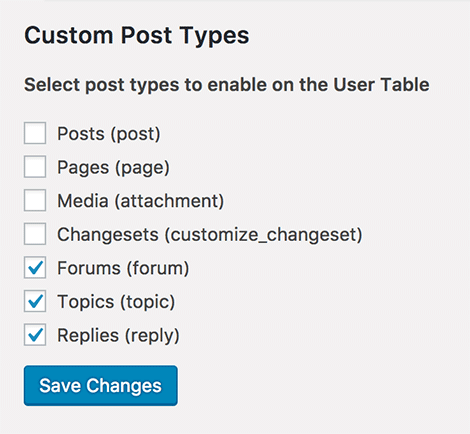 Anything that is saved inside of WordPress has a high chance of creating a post, and therefore it’s going to be in the activity panel. This section includes a quick overview of the latest elements for each content type, but you can also see all user posts for that section by clicking the “View All” button. Today we looked into how you can easily list and filter your user generated content. We saw the different methods for filtering, ordering and quickly checking all the user submitted posts and comments. By the end of the day you should be able to identify your most and least active users, as well as quickly check the content that they have created.